Skip the base engine: Ford's 3-cylinder is better for fuel economy, and the turbo ST is fantastic for cheap-car thrills. The 2017 Fiesta drops pro handling moves in ST trim, and 3-cylinders excel at sipping fuel--but all Fiestas have very tight interiors. Small cars like the Ford Fiesta get the brunt of our TCC Rating system. It's tough to make small cars look great; performance is usually middling, and interior room cramps us up, by design. Gas mileage? 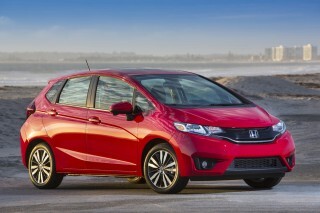 Subcompacts don't even win there, not compared to 35-mpg mid-size sedans and battery-electric vehicles. So believe us when we give the Ford Fiesta a very low overall rating. There are things about it we find very charming, particularly when it's trimmed out as a sporty ST.
And while it's not resolutely grim like the teensy cars of a decade ago, it's not the best choices for most buyers. Expressive, sporty looks and good steering are one thing; notably poor crash-test results, quite another. The Fiesta comes in S, SE, Titanium, and ST trim. This year's sole major change is deleting the manual on Titanium models; a dual-clutch automatic is now standard on those. The Fiesta's design is bold and spunky. 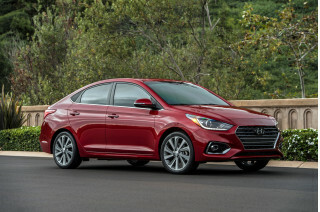 Five-door hatchbacks are the sportier and better-looking of the two body styles, but there's a four-door sedan in the lineup for those who prefer a conventional trunk. The five-door looks stylish and even a bit racy, especially in ST form. There's no ST sedan, and that's fine, as it looks ungainly and skinny compared to the hatch. The Fiesta's cockpit once excited us, but the infotainment screen isn't integrated very well, and rivals have long since passed its plasticky feel. With impressive steering and handling and a nimble, maneuverable feel that's better than most softened, numbed appliances its size, the Fiesta is securely on the fun-to-drive side of the ledger in any form. The Fiesta lineup includes three engines. 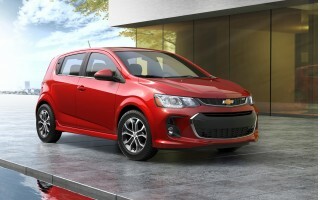 Most buyers will choose the base 120-horsepower, 1.6-liter inline-4. At 2,600 pounds, the base car isn't quick but it feels peppy enough, especially if you get the manual transmission and keep the revs up. We're not big fans of the dual-clutch automatic, which does a bad impression of a lazy torque converter-equipped automatic. Shifts often are clunky, especially when cold. A more frugal SFE version comes with Ford's first 3-cylinder engine, a tiny turbocharged 1.0-liter unit paired with a manual. With 123 hp and 148 lb-ft of torque, the little 1.0-liter is more enjoyable than the base inline-4. Keep the revs up and drive it aggressively, and you may become a fan of this quirky engine. Plus, it's very frugal. On a 350-mile road test, we got more than 40 mpg. The hot-hatch Fiesta ST—which is not only quite a looker but by far the fastest Fiesta—features a 1.6-liter turbo-4 with 197 hp and 214 lb-ft of torque in overboost mode. It's mated exclusively to a 6-speed manual and with upgrades to braking, suspension, steering, and even tires (summer performance rubber is standard), it's a hoot to drive and hits all the right hot-hatch buttons. The Fiesta's cockpit is too small for us. Base front seats are flat and unsupportive, the back seats don't fold fully flat for hauling cargo, and the suspension can hop on rough surfaces. A coarse-sounding engine can detract from base models, though the ST pipes in engine sounds that put us in the mood better than Barry White. The driving position is great no matter what the model, and with the available Recaros in the ST, there's enough support for demanding mountain roads or all-day cruising comfort. Crash-test scores are low, and the Feds note the Fiesta's rear door intruded on the cabin in its test. A rearview camera can only be ordered as an option on Titanium models. The entry-level Fiesta S model is quite basic despite its spiced-up look; manual windows and steel wheels with hubcaps betray some cost-cutting, though at least air conditioning is included. 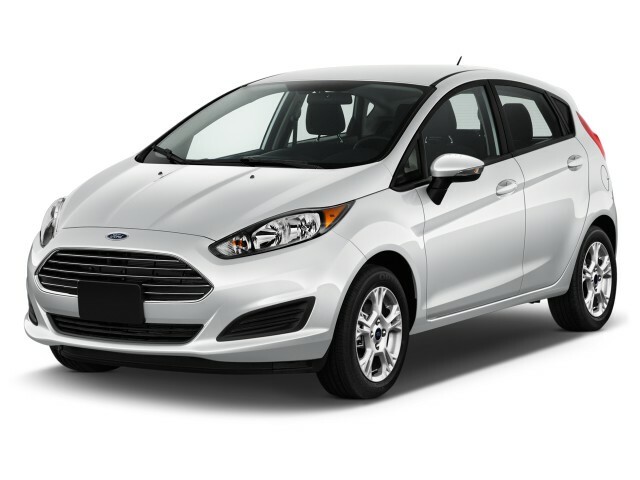 Fiesta SE models add a lot more popular equipment, like a perimeter alarm system, an upgraded cloth interior, and ambient lighting, while the Titanium model includes upgraded Sony audio. Standard on the Titanium and available on the Fiesta SE and ST is the new Sync 3 system for controlling audio, connectivity, and navigation functions via a touchscreen, as well as voice commands. The Fiesta looks entertaining, but the interior's a busy place. The Fiesta tries to live up to its name with an expressive look, inside and out. It's still a good-looking car from most angles, still an extrovert but now up against a fleet of rivals that have excised almost all the frump. The Fiesta has a crisp profile, an arched roofline, and a wedgy side view. The headlights sweep well back into the fenders, and the wide-mouthed Ford grille, with lower bodywork, gives it a tougher look than it first wore. The five-door does a better job entertaining our eyes. The four-door sedan is more a work in progress. 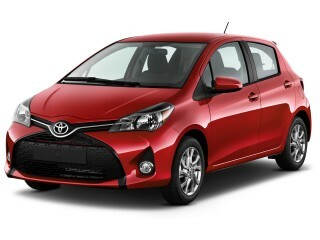 The proportions just don't come together in the appealing way that they do on the hatchback. The sedan's longer body and short passenger greenhouse conspire to make the car look tall and narrow from either end. The Fiesta ST hatchback really makes the most of the look, adding a more aggressive air dam and black-honeycomb-mesh grille, along with a cross-patterned rear diffuser and twin chromed exhaust tips. The lowered stance and chunky wheels add to the visual drama. Inside, the Fiesta was initially one of the sharper entries in this class. The soft-touch upper dash, substantial dash and door trim, and quality seat fabrics give the car a slightly upscale feel. The newly available Sync 3 system, with a 6.5-inch touchscreen, is also a feature you'd expect on a more expensive car. But there's a cloying collection of buttons festooned across the interior, and the infotainment system sits in a wedge of controls that's obviously been plugged like a wine stopper into the middle of the dash. In an echo of its past, Ford clusters some controls in round switches and knobs, letting design have its way over clear and efficient operation. The Fiesta ST is a legitimate hot hatch, and most versions are fun to drive; we're no fans of the dual-clutch. The Ford Fiesta offers three different engines, each with its own character and set of goals. 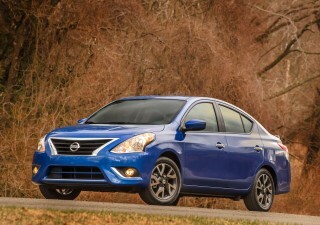 Most models are equipped with a 120-hp, 1.6-liter inline-4. It comes standard with a 5-speed manual, while a 6-speed dual-clutch automatic is available. The manual is fine, and good for keeping the engine in its powerband, but we haven't been impressed with the automatic—it helps the car with gas mileage, but doesn't always downshift promptly or even upshift as smoothly (in the lower gears, especially) as a typical automatic. The dual-clutch does a poor impression of a conventional torque-converter transmission, with clunky and poorly timed shifts as the result. With the standard 4-cylinder engine, if you're willing to keep the revs up, you'll be happy enough with the performance you can extract from the Fiesta. It's plenty to move the 2,600-pound car quite well. It's not quick by any gauge (we're talking about ten seconds to 60 mph), but there's a sense of responsiveness you might not expect considering it's a car that can hit 40 mpg. The 1.0-liter turbo 3-cylinder engine, available in manual-equipped Fiestas, makes 123 hp. That's more power than the base inline-4, and it uses less fuel to boot. The little turbo-3 has a distinctive engine note that sets it apart from the indistinguishable sounds of all the 4-cylinder subcompacts on the market. A kind of thrumming sound arises as the engine speed rises. You have to drive it energetically, and shift a lot to keep up with the fastest traffic. If you demand maximum power while the engine is at low revs, a different kind of rumbling sound comes from under the hood—along with a noticeable lack of any increased forward motion. In other words, drive the 1.0-liter Fiesta as a European would, and you'll not only keep up with traffic, you'll come to understand why small cars with small engines can be so much fun. The Fiesta ST's turbocharged 1.6-liter 4-cylinder makes 197 horsepower, which goes a long way in something so small and light. With 148 lb-ft of torque made at just 1,400 rpm, this little engine is bound to feel considerably stronger than the base 1.6-liter inline-4. It is only offered with a manual transmission. That's great for purists but the lack of an automatic will limit sales. Much like the original Mazda Miata, the Fiesta does a great job convincing you it has more performance credentials than it really does, and good steering and suspension tuning is key to this. The electric power steering system has just the right amount of weighting and feedback, and the Fiesta feels responsive and nimble, but secure enough for highway trips. Our complaints about the dynamics are minor. This is a short car, and noticeable nosedive when stopping quickly is somewhat bothersome. The ride quality is also problematic. The Fiesta tends to hop over more jarring pavement bumps and potholes. The performance leader is the Fiesta ST, which won't disappoint those inclined toward a hot hatch. This is a model with enough performance chops to excite serious enthusiasts on a budget. With the same basic layout as the other Fiesta models, plus a somewhat lowered, stiffer suspension, rear disc brakes, a quicker steering ratio, and a torque vectoring system to help get all the engine's 214 pound-feet of torque (in overboost mode) to the road effectively (through grippy summer performance tires), the ST has the goods to challenge the likes of the Mini Cooper S and Hyundai Veloster Turbo. It might even win some buyers away from larger fast hatches like the Volkswagen GTI and even the Ford Focus ST.
Space is tight in the Fiesta, and its basic front seats are poorly shaped. The Ford Fiesta is small, even for the subcompact car class. That pays great dividends in handling, but when it comes to carrying people and stuff it turns the Fiesta into a penalty box. Don't be fooled by the nicely contoured front seats. The Fiesta's front chairs are flat and have short bottom cushions. They're the closest things to upholstered bar stools that we've experienced in a car. The space surrounding them is very snug, and it gets more snug in back, where leg and head room are very tight. Adults over 6 feet tall won't be especially uncomfortable back there. Like many smaller cars, the Fiesta's body is quite narrow, meaning that you won't be able to fit three adults in back, and the driver and front-seat passenger will occasionally rub elbows. Swap into the Fiesta ST performance edition and the Recaro seats are form-fitting, but have much more lateral and low-back support. They also cut into what little rear-seat leg room there is. The ST also has a lot more engine noise, though it's welcome in this car; Ford pipes intake noise into the cabin for a good go-fast soundtrack that isn't too fast or furious. There's nothing remarkable about the Fiesta's 60/40-split rear seat back, which doesn't fold fully flat. It's usable in a pinch for cargo, but the hatchback's cargo area doesn't offer anywhere near the space of the segment-leading Honda Fit. 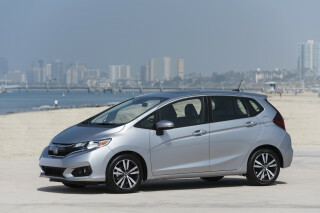 Five-door models offer a capacity of up to 26 cubic feet (compared to 52.7 cubic feet for the Fit with its seats folded). The sedan has a fairly roomy 12.8 cubic-foot trunk. We appreciate Ford's effort to keep the Fiesta's interior from being drab. Interior trims and materials are a strong point and it's all very well-coordinated. The cupholders are well placed, there are plenty of small storage bins, and the driving position is excellent for those who fit. Ford has also done a reasonably good job with sound deadening, including a laminated windshield and a sound blanket under the hood. Crash-test scores have sagged with age, and the Fiesta doesn't have a standard rearview camera. The aging Ford Fiesta suffers from poor crash-test performance and a lack of standard safety hardware. 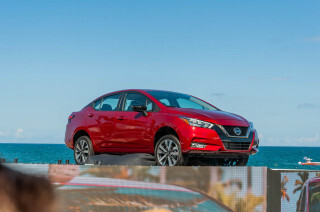 Standard safety features include front and side bags for the driver and front passenger, as well as rear side curtain bags, and a driver knee airbag. The electric-assist power steering incorporates Pull-Drift Compensation, which keeps the Fiesta tracking properly on crowned roads or in heavy crosswinds. Bluetooth is standard, but a rearview camera is an option, and not available until the Fiesta hits Titanium trim. As for crash-test ratings, they correlate directly to the Fiesta's size and age. The IIHS has given the Fiesta hatchback its top "Good" results in large frontal, side, rear, and roof-strength tests. But in the small frontal offset test it achieves just a "Marginal" rating, one step above "Poor." In NHTSA testing, the Fiesta earned four out of five stars in the frontal and rollover crash tests. The Fiesta earned five stars on its side-impact crash rating. However, the agency noted that the left rear door intruded into the cabin, which could lead to a higher risk of injury. Sync 3 is an infotainment improvement, but most Fiestas have a sparse set of features. The Ford Fiesta can be fitted with some of the touches found on bigger, pricier cars. Most come only on the most expensive models, though, while other versions omit necessities. Base Fiesta S sedans are priced from just over $15,000; hatchbacks cost a few hundred dollars more. At this price point, you don't get power windows or cruise control, but Bluetooth is standard, along with a tilt/telescopic steering wheel, a six-speaker AM/FM/CD sound system, and air conditioning. A 5-speed manual is standard, while the 6-speed dual-clutch automatic is an option. 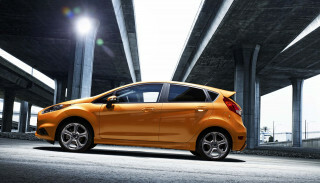 The Fiesta SE puts in the missing power windows and cruise control, and adds keyless entry. A moonroof and remote start are options. Option packages bundle features like 16-inch wheels and the Sync 3 infotainment system. It has a 6.5-inch touchscreen, smartphone-app connectivity, and two USB ports. The same package also brings with it a leather-wrapped steering wheel and shift knob, cloth-covered sport seats, and satellite radio. The fuel-saving 3-cylinder engine costs about $1,000, and comes with 15-inch steel wheels. Top-of-the-line Titanium model includes leather heated seats, automatic climate control, heated side mirrors, Sync 3, Sony premium audio, and other extras that make it feel far better equipped than you might expect in a low-cost small car. A rearview camera is an option even on this model, and power seats aren't offered. The high-performance ST comes equipped like an SE, but with all sorts of exclusive sporty features, including unique ST-logo sport seats, black-painted interior finishes, aluminum sport pedals, black headlamp bezels, the high-mounted rear spoiler, special bodywork, and 17-inch alloy wheels with summer performance tires. And then there's the other performance equipment, including a sport suspension, upgraded steering and brakes, and the 197-hp turbocharged 1.6-liter inline-4. Partial-leather Recaro seats are available as a $1,995 option on the ST; they are heated, as are the exterior mirrors when these seats are chosen. The most efficient version of the 2017 Ford Fiesta will manage 31 mpg city, 41 highway, 35 combined, according to the EPA. That's frugal for anything without a battery, but also fairly rare. Most Fiestas manage 27/37/31 mpg, according to the EPA. By the 2017 numbers, the high-performance, turbocharged Fiesta ST earns decent but not spectacular ratings, at 26/33/29 mpg. The base engine is a naturally aspirated 1.6-liter inline-4. It's rated at 27/35/30 mpg with the 5-speed manual gearbox and 27/37/31 mpg with the 6-speed Powershift dual-clutch transmission. In our experience, that seems realistic. During a 350-mile test drive, which included roughly two-thirds highway and one-third stop-and-go suburban driving, we achieved a striking 41.9 mpg as indicated on the car's display. 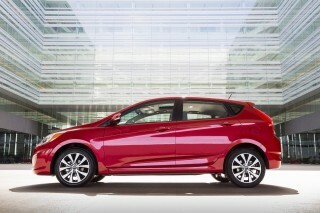 We'd also note that many mid-size sedans best the Fiesta for fuel economy. Small cars just don't have the aerodynamics of bigger ones, and at highway speeds, a Fusion does a better job of cutting through the air and skimping on fuel than does a turbo Fiesta.